February seems to be shaping up to be the month of Linux tablets. Just last week we saw the announcement of the forthcoming Spark tablet running Mer Linux and KDE, which has caused plenty of excitement among Linux fans. Now, the latest news appears to be the Trimble Yuma, a rugged tablet from SDG Systems that now runs Ubuntu Linux. Targeting military and industrial applications requiring data collection, inspection, and reporting from the field, the Linux-powered Yuma can be used with geospatial software including GRASS GIS and Quantum GIS as well as other standard or custom Linux-based applications. The device is available starting at $3695 on SDG's website. The 2.6-pound Yuma tablet computer from Trimble has actually been around for some time loaded with Windows 7, but this new Ubuntu version was announced Thursday by SDG in response to customer demand. “Our customers have told us that they need a rugged, military-grade, tablet computer running Linux,” explained Todd Blumer, president of SDG Systems, in the company's press release. Ubuntu 10.04 LTS Netbook Edition is the specific Linux distribution used, but others can be substituted upon request with a minimum purchase agreement or engineering fee, SDG says. Either way, the rugged device is powered by a 1.6 GHz Intel Atom processor and features a 7-inch sunlight-readable touchscreen display in a magnesium alloy shell. Loaded with Wi-Fi, Bluetooth technology, two cameras, and GPS, it also offers additional expansion options via SDIO (SDHC) and ExpressCard slots. A solid state hard drive with either 32GB or 80GB of storage, meanwhile, helps protect against the stress of impact and vibration by eliminating the need for moving parts. As part of its “rugged” classification, in fact, the dust- and water-resistant Yuma meets the United States Military's MIL-STD-810F standard and carries an Ingress Protection (IP) rating of 67. Optional accessories include a docking station, and industry-standard DB-9 serial and USB host ports provide a convenient way to interface with field or factory equipment. 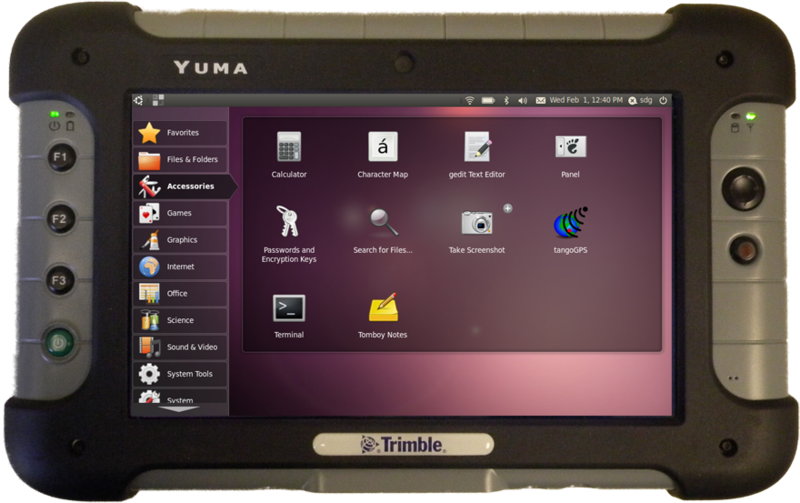 The Ubuntu-powered Trimble Yuma isn't going to be a tablet for ordinary purposes, of course. But if your business ever takes you into harsh conditions, a device like this could be worth the investment.